People who look for consistency and patterns in Nintendo's thinking often come up with absolutely nothing beyond a Mii in a hot dog costume, but Reddit user Natzore has discovered something of actual worth. Looking through the past schedules for Nintendo Direct presentations, it seems Nintendo has been quick in the past to follow up a Nintendo Direct Mini with a full-fat Nintendo Direct, rather than just letting them sit as they are. Of course, Nintendo have often bucked even their own trends, so this is certainly not hard evidence, however the strange absence of larger games such as Bayonetta 3, Yoshi, Wolfenstein II: The New Colossus, and Fire Emblem in yesterday's presentation does seem unusual. Do you think there's anything to this research, or is it entirely unfounded? Let us know in the comments below. Very interesting. Of course I'd gladly welcome another direct. Not getting any new info on Yoshi seemed odd to me. Already hyped for another Direct. I hope this is true. I’m only asking for one thing: Animal Crossing Switch. I hope there's another one. It would be terrible if that was it, so much was missing. Hopefully that Direct Mini and Following Direct pattern continues and they redeem themselves. Yeah, this is exactly what I thought Glad to see evidence supporting it! Yeah I've seen this and thought the very same thing when it said mini. So there's still hope for the big titles! It makes sense that there could be another one soon when you look at the games that are coming this year that never got mentioned. I hope this is true as I found the mini to be disappointing in general with Nintendo really falling back into old routines of releasing old content and not enough new. Ports or not, I don't care. Knowing that Dark Souls comes to the Switch so I can play it on the go is more than enough for me. I've been a fan since Demon's Souls and being able to play the pvp of the first Dark Souls again makes me really happy, since eliminating poise (or making it a hidden value, whatever) ruined the pvp on the next two games for me. I like research and statistics, and the first thing that jumps out at me is that almost all of these took place in 2012 and 2013 when Iwata was still alive and running the show. None in 2014, 1 each in 2015 and 2016, none in 2017. So the pattern has kind of fizzled out. Not saying their won't be one, it's probably 50-50, and it's probably due in mid-Feb just before B1+B2 and the SMO update releases. Yoshi is probably Sept or Oct, they can wait awhile on that as they focus on Kirby, Showing both of those off at the same time makes Switch look a little too focused on 2D platformers and ports. So they may actually wait until E3. Or they may put 1 out in 5 minutes. We can guess all we want, but none of those guesses will be educated. Edit - But if you are looking at a real reason for a new ND, it's none of those games, it's the complete lack of any mention at all of the 3DS, except the HW DE will include stuff from HW on 3DS. And they need to tell us about paid online before they start charging for it. So a ND will be forthcoming, probably Feb, or March. Or April or May. Or they'll just wait until E3. I think it may be unfounded. I looked at that myself yesterday and it's important to note that most Minis were about a single game or service and not like the one yesterday. It doesn't seem common for there to be two announcement heavy Directs in a row. I do think there will be a game-specific or service-focused Direct next month, but not sooner than that. I'd love to be wrong though! That really isn't that hard to believe. Let's get back on board. I love the suspense. @BoilerBroJoe The question is then why was yesterday's Direct considered "mini"? Because it didn't include an actual host? @SLIGEACH_EIRE Yet so much there, in 15 minutes. The mini lets a few smaller titles and third parties not get overshadowed. Give the media a few days to stew on Mario Tennis and don't step on the toes of the third party support that you're trying to build up by dropping a big first party announcement. Hopefully there is another Direct before Bayonetta 2 on Feb 16. I was left underwhelmed to be honest. I'm sure there will be another one soon. Although, I don't know if all the games will get addressed, but online and system is a strong possibility from the "fake" video. I believe another direct is soon but I don’t expect it for another month or two. Nintendo’s release calendar for spring is filling up and I don’t think they would announce their summer titles this early. The next direct will be a real info dump they're not going to wait till e3 to give us info on the online infrastructure and that is really going to have to be addressed sooner rather than later, so having this mini seemed like a way of slimming down the next one. @Kalmaro It's all I want! There was a HUGE list of games missing from yesterday’s direct considering it was a 2018 preview direct, albeit a mini direct. The rumblings and hints were for a Direct in Jan, which wasn’t the mini one. January 11th’s broadcast date would mean a January main Direct still has 20 days left to count as a January direct... that would certainly fit the hints, the rumours and the 20 day max broadcast day gap table above. Given how light that Nintendo Direct Mini was, I wouldn't be surprised if there was another very soon. In fact, it's needed. @gatorboi352 - It was a mini and I was content with it. I feel the people just hope that one will match the hype they fuel themselves over it. Wouldn't see it as sad, but this does reflect the desire to see a system from Nintendo doing what we all hoped for all these years for a success that wasn't fueled by the big blue ocean. It shows that this hype is here for a reason, and it's not put of desperation. It's fueled by the monumental success the Switch has garnered this far. Why does not mentioning those games seem unusual? If they're not coming out by May why mention them last fall, yesterday then once again closer to the date? Actual new info on those in another direct outlining the rest of the year makes it not repetitious. I mean, look at Kirby, just because it was announced last fall, everyone yesterday kept overlooking it as a new game. I like the Black Ops reference, nicely done. Ah, the tagline...Black Ops reference! I really want some info on Wolfenstein 2 on Switch...I love that game! I'm not getting myself hyped up again until there's confirmation, especially since the lacklustre mini Direct didn't meet expectations. I'm sure there will be another direct between now and E3, but not within 20 days after the mini Direct. Nintendo showed off a good amount of content yesterday, even if that content was port-heavy. I'm sold, another Direct coming soon! You better be right about this!! I feel like they're saving the full reveal of games like Fire Emblem, Pokemon and Metroid for E3. But I wouldn't be surprised if we still get another direct soon for other games. There are no brakes in the hype train. That's really interesting. Some of the gaps are so small like a day or two but I expect around a 15-30 day gap if there would be a full on Direct. Let's hope it exists and comes soon, the Mini Direct felt... well... Small. With the release schedule calendar already amassed, I'd be more than content with getting next Direct sometime in mid-spring. But if it does hit in 2-3 weeks... what to say to that? Itadakimasu! To be fair, this pattern makes sense. The surprises of a mini direct wouldn’t get half as much attention if they were part of a larger Direct with true bombshells in. And they need a wide range of games of all sizes to keep the release schedules full. Oh man... that hype train again... LOL, bring those announcements on, Nintendo! Oh wow I'm on NintendoLife! Hi mom! Oh gosh, not this again...I am very happy with what was shown already at the direct mini. I am not gonna go through that fervent waiting again or I'll go bald! So you think they didn't make a larger direct because they were holding back Yoshi, a barely-started game, and a port? That... seems unnecessarily hopeful. Also, what kind of fanbase is this that people just had roughly 6 cool games and a bunch of DLC up through May, and all they want is more more more? Seems like a pretty safe bet, that there be another one before spring. I mean, like it was said before, many of the bigger games set for this year were not even mentioned, plus there gotta be something happening with VC, the online service or at the very least MyNintendo before autumn ... right? RIGHT? Point being, another Direct might not necessarily be focused on purely new games. That is not to say that they might not chose to shine a spotlight on one particular game or another as well - even if it's "only" a port or maybe a 3rd-party game. Why are so many people complaining about the mini direct? There was plenty announced, like Dark Souls, which yeah it's a remaster, but considering the series has never been on a Nintendo system, it's practically a new game. Idk. I don't understand the entitlement sometimes. My toad senses says that I highly doubt it. We may at least get a self-contained direct. That sure would be nice but I’m not holding my breath. I know that the mini direct to normal direct ratio DOES make sense, however, I wish people would stop trying to make sense out of Nintendo. They do what they want, when the want. People that try to predict what they will do will usually be disappointed. But haven’t the “mini” directs, in the past, been focused on one game or so? This one had a lot more stuff covered than a mini usually had, I’m not so sure we’re getting another so soon. Nah there have been several general mini directs. Like I wrote in the forums, this mini direct could be just like how the last Nindie direct was a prelude to the big September direct last year, i.e. this Mini Direct covered all the small games that won't get mentioned in the big, full-size direct coming later. Of course it's just a theory, but it still seems pretty likely to me. There probably will be a new direct soon. Nintendo still need to show xeno dlc, octopath plus the "new experiences" Kimishima talked about. Then theres the 6 new Switch sku's mystery from Amazon. I believe they'll have another pretty soon. They know we all want to know what the hell is going on with the paid online service. And I'd certainly love to hear more about Bayonetta, Wolfenstein, and Yoshi. I find this a little hard to believe but I do remember us getting Directs spaced closely together. So... maybe? But what else is there to show us when this was clearly a direct geared towards Spring releases? @Paddle1 I hope the word "Mini" wasn't simply added at the last second when they saw the hype had gotten out of control. Genuine question: Are you trolling? I agree. In my opinion a Direct MINI only suggests a full-fledged Direct is near. Hi everyone! I know you are probably all excited thinking about the a full direct that will (hopefully!!!) be coming soon, but I'd just like to introduce myself I'm not new to this amazing website, but I have finally decided to begin leaving some comments Hope you all have/had an amazing day! I thought yesterday's mini direct was a satisfying appetizer with cool ports and surprises, so an indication that a bigger direct is coming, most likely stating more stuff for Switch and 3DS (and hopefully announcing that Link's Awakening remake for 3DS), is a fantastic and I am anticipating for another big direct in the coming days. Great background Art, as always! @westman98 @Shiryu "Shiryu is a member of staff"
So I guess this is not trolling? I just hope it was not a Hyrule Warriors style definitive edition port. It could use the same engine and assets from Wii U, but I hope there's new content (stages, characters) and updated characters (like BotW versions of Link and Zelda etc). They should take the Splatoon 2 route with periodical updates. The new Smash would be an excellent game to introduce the new online infrastructure with. While I enjoy these Nintendo Directs and the rapid fire reveals they bring, I think they just pander to this entitled attitude of many of today's gamers, particularly when reading some of the comments on here. I remember the days when maybe we would hear about a game reveal in a magazine, or we would wait a few weeks to get the coverage of shows like E3 or TGS, how did we cope! Games will arrive when they arrive no matter whether they are revealed in a direct mini, full direct, live game show, Twitter, magazine etc. I could keep going, but hopefully the point gets across. We may get another Direct soon, but there is no pattern here to indicate if it will be a 20 minute look at a specific game, or a rapid fire look at several games. In 2012, Nintendo did more regionally specific Directs than they currently do. The "Mini" Direct yesterday covered far more games than most of the Directs on this list. Obviously those Directs covered their games in more detail due to the focus on a specific topic, but this list does not offer anything resembling a pattern. Especially when most of the examples are 5 to 6 years old. I'd love another Direct soon, and I would not be surprised if we get a specific game Direct, or a 3DS Direct in the next few weeks, I just don't think those dates mean anything when you look at the topics and regions covered and try to compare them to the Direct yesterday. @Mince-Pie Welcome to Nintendolife! Hope you have a wonderful day as well, and look forward to lots of amazing discussions about all things Nintendo! @Moshugan @westman98 Please understand: I have never trolled anyone in my life, online or otherwise. But being a member of the staff as nothing to do with this intel. Smash Bros is my educated guess to the upcoming announcement because what we saw yesterday wasn't definitely not everything Nintendo had prepared for January. We will all soon find out. PS: Do note that this is the usual terrible situation when I have friends working inside Nintendo who are under NDA and obviously fear for their job security if leaks come out but are also Nintendo fans and are dying to tell us about all this cool stuff that is yet to come. Pretty sure it's unfounded in this case. I think the next Direct will be the usual March/April Direct. This Direct pretty much revealed the lineup through May. It stands to reason that Yoshi, Fire Emblem, etc are coming in Summer or later, and therefore aren't necessary to talk about until said April Direct. 3DS games at this point are pretty much just localizations and a few small games. All that stuff can be revealed via Twitter honestly. As for the Switch online services, I don't get why people absolutely insist that they'll talk about it in a Direct. Where does it say that they have to talk about that in a Direct? If you ask me, it's MUCH more likely that they don't do that and talk about it via press release/trailer drop/Twitter instead given how Nintendo has approached this type of thing in recent times. In short, they did a Direct Mini because that's all there is for the next few months outside of indies and maybe a third party game or two in May (coughWolfensteincough). Everything else either doesn't need to be talked about in a Direct or is coming later and doesn't need to be talked about until the usual March/April Direct. I realize that sounds negative and I don't mean to be a buzz kill, but I'm positive that that's the reality of the situation. I'm not expecting another direct this month anytime soon. I'll probably eat my words later, but I'll not take them back. @Shiryu It's true, right? You can say that you cannot confirm or deny it. @IceClimbers Part of the reason people want another Direct is because for many, this was a pretty lacklustre lineup of games. When one of the biggest games shown was a Mario Tennis game, that kinda says a lot. I can't see another direct until Easter which is March and would pace the E3 one perfectly. I expect a Direct on March 3rd. It's most likely we'll see it between 10 and 13 days from the direct mini. That's some interesting stuff. In that case... the hype train continues it's trip. Next stop - full Nintendo Direct. After that - E3. Makes sense, have a showcase for ports and indies alongside other minor announcements before the bigger titles. Would still keep expectations in check though. Winter Directs are always big, but we know the announcements count the most at E3 when the general gaming audience is also listening. @IceClimbers The problem is, why would Nintendo tease us with essentially an appetizer, only to go radio silent for the next 2 months. They as others have mentioned, they usually follow up a mini Direct with a full sized one a few weeks later, so we're getting a lot sooner than you think. Plus, the Japanese Direct page also has another blank spot. That's usually the first sign a new one is in production. Difference is that’s when the 3DS was still a thing. We won’t see another direct til March. @DrRandle Yoshi isn’t “barely started” actually. The Nintendo Treehouse demonstrated it. Also, Yoshi development time is quick. I'm telling you, you should not start hyping another direct. I think that the reason why Nintendo choose this mini direct route, is that expectations started to become ridiculous. Yesterday's Switch Direct Mini was fairly news-packed, though I suspect at least one other Direct between now and E3. I'd also like to see more info about upcoming 3DS games, or at least the ones we know about/have a chance of being ported outside of Japan. I believe this may be the 3DS's last good year, but that doesn't mean there aren't any games coming out for it to look forward to (though they may be few). Ye this is quite clever. Although all they have to do is look at nintendo direct archive online. But i wouldn't of thought of looking at all the direct dates and comparing them to the non direct dates that's the clever bit. sry mean't micro direct dates. @NIN10DOXD That was more pointing towards Bayonetta. The last time we saw a Bayonetta teaser and a Yoshi game was in the same direct in 2013. Bayo came out 2014, and Yoshi was a full year later in 2015. 3 years is hardly "little"
Getting the ports out the way maybe, hehheh. Are we really on NintendoLife! Wow.. Holy Sh*T! Hello Daddy! I won't be surprised, I'm kinda suspecting we may get a bigger direct near the end of January. Though that was mainly because the direct was called a "mini" direct so it seemed like there'd be something more. @Justifier I don't think Nintendo cares about what our expectations are. At least not enough to base their direct schedules around it. Look people, there will be another direct soon. Stop complaining about the mini direct. It at least showed some games. You will see more soon. Just be patient and I am sure Nintendo will have more info and surprizes to come soon. but they might do a 3ds one next due too(yokai watch,dragon quest 1-3 remakes and 11 and i think they have a few more new games down the line)The online might come as the one year switch release march 3rd. Well there is an open spot on the Japanese Direct page so maybe they get one.. I rather enjoyed yesterday's direct, a full Direct will be amazing. Definitely can see it happening no later than mid-March. Please, Animal Crossing Switch, Yokai Watch 3 Sushi / Tempura USA version, first trailer of Pokemon Switch ! Yeah of course they should tell us more about the new online service etc but the way I see it it's free until then so I don't really mind all that much. Blimey we've just had something and already the chatter is out for the next one. I'm happy to wait and ignore the rumours. @SLIGEACH_EIRE Looking at your list, it would also seem likely that a full direct is coming. While I hope Nintendo saves some surprises for later Directs, there was some key stuff missing.. like 3ds games and the online service. Gosh dang people. They literally JUST announced a whole gang of games coming to Switch and people are already wanting more so soon? Ya, of course we want more announcements for 2018, but the year literally JUST started. Gonna be a long year people, there's lots of time for games to be announced. Doesn't all have to be the very first or second week of January! And then it's E3, where the REAL announcements are made. But still with plenty of other confirmed games coming like Wolfenstein 2, Y's VIII, Fire Emblem, Pokémon, Metroid Prime 4, SMTV, Dragon Quest XI, DQ Builders 2, Valkyria Chronicles 4, The World Ends With You, etc etc etc. Settle down. The 90 day window from mid February to mid May is already more packed than any thing we saw last year, and last year was crazy. And they're all super high-quality games coming too. And more are being announced with every passing week. Someone noticed Southpark Fractured But Whole listing went up on a retailer listing today slated for March. Settle your butts down, the year just started. I hope there is another direct soon, for me the mini didn’t hold much interest. I have a Wii U and the games they porting, not keen on M+R and none of the indie games take my fancy. Want to try Payday 2 and Dark Souls but not at £50, only Kirby was of any interest. But even feeling like this I think it was a good direct. I’m not sure if/when the full direct airs but i think it will focus on the online structure/vc. I do believe it the info will be wedged between two games. First I hope will be a FPS maybe Overwatch or CoD collection (not a FPS fan but the console needs some) followed by a first party/second party game we don’t know about, don’t think it will be smash yet as the mini was port heavy. Weren't the Mini Directs ususally Japanese specific with games not releasing in the west? Then, a big direct for all the regions? Or, the Mini Directs were just about a specific game? It would be incredible if another Direct was coming soon. I could see it happening because there weren't any headliners in that Direct. Nothing to WOW people for the future. However, it was a solid, solid Direct with many great games that are prime fillers in the calendar to tie people over and appeal to a wide range of audience. My first thought was where is Fire Emblem, Yoshi and other bigger confirmed 2018 games? We'll see. A few new games announced in a mini direct (Dark Souls yes! ), not too shabby. Expect a maxi direct before March with meatier reveals including South Park Fractured But Whole (March release?) and more info on the upcoming games we know about. As for the ports, DKTF definitely deserves a bigger audience than it reached on the Wii U; it's one of the best games of recent years in my opinion. I was fine without the Mini, but the more the merrier. Hype! You have said everything I wanted to and saved me the effort. People act like all the games you mentioned don't exist because they aren't in a Direct. Then pan the games announced in the Direct. OMG to a long time Nintendo fan it seemed solid. You get TWEnds, MarioT, Dark Souls, DKTF, Hwarriors, and Ys all previously unannounced and people act like thats nothing. I was stoked over Mario Tennis. People are gaga over Golf Story and it pretty much took everything from Camelot and the old gba/gbc Mario golf/tennis games, now Camelot is making a modern MarioT RPG and I am sure its going to rock. The WiiU had some fantastic exclusives that so few people played. Many of them really deserve to be played in a portable format. I just don't think anyy real WiiU owners are but hurt like the trolls in this thread pretend to be. Reposting this since it's very much applicable. So we've already got as many new games in the pipeline, that we already know about the second week into the year, as we got the entire year of 2017, e3 announcements and all. And we've already got 2 more ports as well. And we haven't even gotten to the spring direct, E3 or the fall announcements yet. And we definitely have way more third-party support in the pipeline than we did last year. Many of which are exclusive (The World Ends With You, Octopath Traveller, SMTV, No More Heroes, etc). I expect footage of the newest iterations of Bayonetta, No More Heroes, Metroid, Smash Bros, F-Zero and Eternal Darkness. The list posted in this article actually does cover every Nintendo Direct Mini except for the ones that had another Nintendo Direct Mini right after it. Although, some of the Directs that came after the Nintendo Direct Mini were not general Nintendo Directs, but themed Nintendo Directs that cover something specific. The next Nintendo Direct could be a general Direct like in April and September 2017, but it could also instead be a specific themed Direct entirely about "Nintendo Switch Online" with its Virtual Console equivalent being the "featured games" of the Direct. No matter what the theoretical Direct is about, we'll find out in 20 days or less if Kimishima's Nintendo will be continuing the tradition of another Nintendo Direct shortly after a Nintendo Direct Mini. No Nintendo Direct on 2014? Huh must had been a very boring year then. @retro_player_22 There was Nintendo Directs in 2014, but there was no "Nintendo Direct Mini"s that year. Honestly, I would have been happy had the mini Direct been the Direct, but the thought of even more news is definitely exciting! So many good games coming to the Switch in the near future. @SLIGEACH_EIRE I honestly don't understand what you don't like about ports and remasters. If they're new to you, which I know all these games are because you've made it very clear that you expect AAAs to come to a Nintendo system rather than having to buy a PS4, Xbox One, or PC, then what can it possibly matter that other people can play them on other systems, or that other people have already played them? A good game is a good game, and not being both new and exclusive doesn't change that. Of course. The actual direct will be discussing all the new features of OS 5.0 which comes out in Feb. The Mini Direct is just a starter meal to get you ready for the main course. @Bondi_Surfer Every Nintendo Direct Mini in the past was shortly followed by a Nintendo Direct. So it's not listing all instances that fit the pattern. All instances fit the pattern. @SLIGEACH_EIRE Would you elaborate on how SNK Heroines is a remix, but Mario Tennis is a new game? The difference isn’t in quantity. There’s a strong line-up in terms of pure numbers. But in games that appeal broadly. Bayonetta is a niche game as is Dark Souls (as is Metroid). Kirby and DKC will appeal to the 2D platforming crowd. Mario Tennis has an audience but, again, comparatively small. The games look great, but where are the heavy hitters to join Mario Kart, Mario, Zelda and Splatoon? Well Pokemon is one. Pokemon often do their own dedicated Directs. So perhaps we will get one of those in the next few months. Then the other two big hitters still to come are Animal Crossing and Smash Bros. But I wouldn’t expect both to land in the same year. New Super Mario Bros, maybe. But they won’t be making all these at once. Hell, nobody wants them all at once because you’ve got to play them. It might be, but then again it might not. That's my best guess. They really are letting Mario where what he wants these days . It couldn't have been comfortable playing tennis all these years in his overalls. @aesc May your Michiganese source be right. I should hope so, the mini was underwhelming unless as a devoted Nintendo fan you owned none of those titles the first time around. I thought the Direct Mini was pretty darned good. Better, I would argue, than many of their past E3 presentations in terms of interesting content. I think Nintendo should do another direct, but maybe in a month or so. I'm very happy for the time being. Great time to be a Nintendo fan. Well, if they don't mention Pikmin 4, my son is going to give me his Switch.....If they mention Shenmue, Animal Crossing, Excite Truck Switch, or Gamecube or Dreamcast eshop, then I'll buy my own the day of the direct. Shenmue won't come. Excite Truck is possible, but I wouldn't hold my breath. Pikmin and Animal Crossing will definitely come... just, doubtful it's in some dreamed up Direct in 20 days. It might be at E3, it It might even be after that, but I'd be downright amazed if Animal Crossing doesn't come, that's like Mario not coming, it's unheard of, and Pikmin 4 is already done according to Nintendo so, it'll turn up eventually (hopefully this year). I was fine with the mini Direct, but sure, I’d welcome more. I don’t understand why we still don’t have animal crossing. I thought for sure it was coming in the Wii U days, then I thought for sure it was coming to Switch. If it doesn’t get announced this year, I’ll be completely dumbfounded. New Leaf launched in Japan in 2012, it is due. I mean, the Switch hasn't even been out a year yet. Alot of games skipped Wii U, and will be returning this generation. But it's a long 5 years of games. It could come at any time, doesn't have to be this year. I do personally think it'll come this year or at least be announced but, there's no guarantee. Probably on the blue moon. My guess is it will be another Indies Direct. Featuring the Stardew Valley update, Owlboy, and hopefully, A Hat in Time. As I said before, I feel like we get one in February. This was just a mini. Yah, kind of figured as much. But we know we'll see Pikmin 4, and Animal Crossing....How about music on the Eshop and Sega Virtual Console. Yeah, I mean we had that really weird Animal Crossing app on the Wii U that basically only told the time, that’s when I was saying to myself, man it’s gotta be soon if we have that. I suppose it could be that 2017 was so stacked Nintendo opted to hold it back, but yeah I agree, it’s gotta be soon that we get a formal announcement that it’s at least on the way. This is pretty misleading. 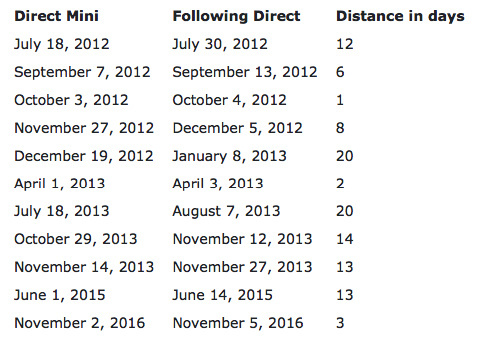 Most Mini Directs were during 2012-13 when Nintendo was constantly doing exclusive mini directs for different regions, even directs exclusive to North Korea or Australia. If you look at the distances between Directs for Europe or NA alone, they're much further apart. Check Wikipedia's ND Schedule Page to see what I'm talking about. @HappyMaskedGuy -Sorry - I'm a regular on NintendoLife - I'm not a Troll - My Better half is Japanese from Kyoto. I don't have an Uncle that works at Nintendo - but we do have friends that work there. Normally - the first time they hear about Nintendo News - it's the same as us - through the media and Nintendo Directs - Their Loyalty to Nintendo is incredible so you can't get any information by being friends. However - In this instance - it is assured that something very very big is to be announced by the end of the month - so big that it is in fact heavily rumoured in the Hallowed corridors of Ninty HQ amongst the staff as it has been difficult to contain. I don’t see what you gain from lying so il take you at your word. So you live in Kyoto? Oh man I would love to visit, how long have you resided there? @Nicolai Directs are more Worldwide now, so there's little reason for region specific ones anymore unless its a game that's currently region exclusive (which will be rare). So there's very likely a Direct following in the next couple weeks. Plus, the Mini Direct to Direct transitions aren't even the biggest indicator, the Japanese Nintendo Direct page currently has another blank spot. That's usually one of the first signals a new Direct is in production. Animal Crossing Wii U in development and planned for a 2016/2017 release. Wii U hardware didn't sell well enough holiday 2014. Animal Crossing Wii U moved to NX in early 2015 meanwhile progress already made became amiibo Festival. @TheMisterManGuy You missed my point. I'm not predicting the return of region-exclusive directs, I'm just saying the numbers provided are misleading, since Directs were done differently for nearly all of them listed above. Directs now are more sparse than they were in 2012 because Nintendo doesn't have to repeat the same information to each region. To further my point, let's look at the most recent example. On Nov 2, 2016, we get a global Animal Crossing Direct, and 3 days later, Japan exclusively get one for Miitopia. That's not much to get hyped up about. These examples are never followed by a major Direct. This specific bit of evidence is void, but you're right, there were other signs of a Direct soon. I just think it will more likely be in February. The 10 day average given above isn't likely. @Nicolai Thing is, because Directs are more worldwide now, the chances of it being a general Direct increase, as Japan and Europe got a few general Directs in the past that skipped the US entirely. Of course, you are right, it may not be a general Direct. But there's still validity to the point. @ekwcll This. The mini wasn't even bad, so I truly don't get the need to complain on end. Whenever we do get a new direct, cool. Until then, cool. Got some 2017 switch games to finish. Yeah it very well could have been that. I would like to see how many of these instances are "Nintendo Direct Mini" and then big "Nintendo Direct", instead of some other kinds of Directs. Remember, a Nintendo Direct Mini, while small, is a general Direct, which means that it conveys a lot more general information than a specific Direct (like ones for a specific title, franchise, or indies), which means that it can stand on its own when specific Directs can not. A Nintendo Direct Mini can just be "We don't have a lot to show for this time period, so we will have a Mini instead of a regular Direct". There's also the factor of looking at those years, comparing the frequency of Directs back then versus now, etc. There are just too many factors that I don't really feel like were taken into account here. Correct me if I'm wrong. I love this site, but this is the exact thing that builds expectations that are borderline impossible to meet. We had one this week, and now, we are expecting another. If another Direct comes, that’s great, but if we do not get another one for two months, that’s okay too. They already reserved another direct slot on the Japanese website. It could happen or ninty could keep us waiting till March. My bet at the mo is early feb.
Well if the chart is anything to go on, we'll need to be on the lookout until the end of the month. @cfgk24 that’s awesome, make sure you let us know if you get any scoops, or at the least tell me I’d want to know! I did wonder about that. It wouldn’t surprise me at all. The mini direct the other day also didn't have any live footage of the developers, which most directs usually do, in order to communicate more about the essence of the games to the viewers, which I found odd. @cfgk24 Well I'll just have to take your word for it. Hopefully your sources are correct! Would love a big juicy surprise! All I want is a big expansion on My Nintendo. I don't need any new games at the moment, even if nothing but Kirby in this direct was for me. I've got a backlog to work on. Pokemon Crystal VC release coming. Considering the release of Gen 1 and Gold/Silver, I doubt they are releasing Crystal without planning something else around it. I've heard rumours of a Direct or some presentation of sorts coming this week, but also of one for next month. The latter of which would include Fire Emblem as well as Yoshi among other things. Assuming it is correct, I would think the supposed Direct this week would focus on a Switch update, features and Nintendo Switch Online as well as perhaps a couple games. That is just my speculation based on the rumours though. Yeah... really jumping to conclusions over this. In almost all of the examples listed, one of the two directs was exclusive to a single region (typically Japan) and/or focused on a specific upcoming release. If you exclude the regional exclusive Directs and the specials for a specific game, then it becomes clear that they are following a roughly monthly pattern... so the next direct is not to be expected until February. If we were to get another direct before then, it'd either be a regional exclusive (which wouldn't be anything to get particularly excited about) or a special for an upcoming release. None of the upcoming releases we already know about would really warrant their own direct, and have already been covered in the recent direct... so the only possibility would be a game that we either don't know anything about, or are not expecting to be released anytime soon... we can't really make any guesses about the former, but there are two possible options for the latter... Pokemon Switch (there are rumours currently circulating that it is far closer to release than they've let on) and Metroid Prime 4 (there are hints that this could have been in development in secret for years before we got the teaser announcement, so may also be far closer to release than we think). @Skunkfish I like this prediction!